Escape the chilly August weather, and dream over this gorgeous summer wedding at Anam Cara - one of the newest venues on the Kāpiti Coast. This place is an oasis - modern, lush gardens and just a short drive from the beach. What more could you want? Get excited for summer weddings filled with stunning outdoor ceremonies, the warm beach breeze, and near-tropical sunsets! The property is absolutely gorgeous with so many different gardens – each one a little different to the next. There are beautiful native trees, flowers galore and lush green lawns. Ōtaki in summer can get pretty hot, so having a venue that has lots of shade is perfect. 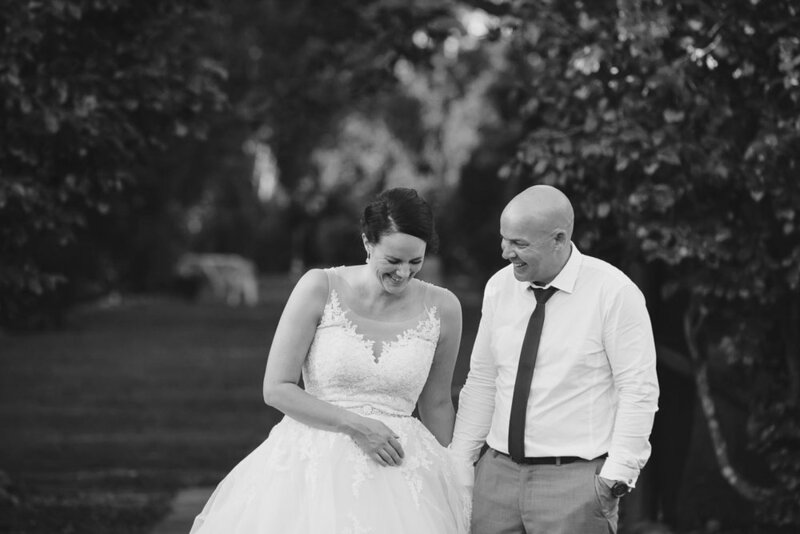 Teresa and Tim were married in the Laneway – a gorgeous alley of tall green trees which is lovely and cool during a hot day! It is one of my favourite spots on the whole property. One of the things I really loved about this wedding was the drinks on the lawn after the ceremony . This area is such a great space – they had a bouncy castle set up for the kids, croquet and games on the lawn, table tennis under the trees and a musican playing guitar adding to the atmosphere. It was fun, elegant and relaxed all at the same time. I love photographing candid moments so capturing the guests chatting and laughing in this beautiful environment was amazing for me. Tim and Teresa are an incredibly sweet couple and I loved being part of their day. I was treated as an old friend and welcomed by their friends and family. Take a look through some of Jo’s gorgeous photos, and see what’s in store for summer at Anam Cara. Flowers and Cake: Sara Grigg (Groom's sister). Your wedding directory, search for everything you need, browse the inspiration and wedding ideas on the blog or join our newsletter, we are here to help you create an amazingly awesome celebration on the beautiful Kāpiti Coast, the wedding destination just a little less than an hour from Wellington. The information contained on kapitiweddings.co.nz website (the "Service") is for general information purposes only. Weddings on the Kāpiti Coast is curated by Jenny Siaosi of Siaosi Photography and assumes no responsibility for errors or omissions in the contents of the Service. In no event shall Siaosi Photography/ Weddings on the Kāpiti Coast be liable for any special, direct, indirect, consequential, or incidental damages or any damages whatsoever, whether in an action of contract, negligence or other tort, arising out of or in connection with the use of the Service or the contents of the Service. Siaosi Photography/ Weddings on the Kāpiti Coast reserves the right to make additions, deletions, or modification to the contents on the Service at any time without prior notice. Siaosi Photography/ Weddings on the Kāpiti Coast does not warrant that the website is free of viruses or other harmful components. The kapitiweddings.co.nz website may contain links to external websites that are not provided or maintained by or in any way affiliated with Siaosi Photography or Weddings on the Kāpiti Coast. Please note that Siaosi Photography/ Weddings on the Kāpiti Coast does not guarantee the accuracy, relevance, timeliness, or completeness of any information on these external websites. Thank you.